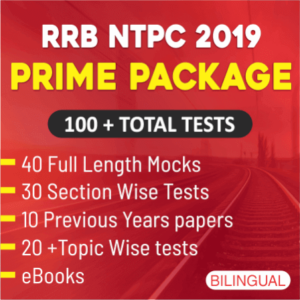 As you all know, RRB NTPC Exam will be held in the month of June-September 2019. So we are here to help you with the Mathematics subject. We are providing daily quantitative aptitude quizzes, which will help you to score good marks in this section. We aim to provide the best study material to our readers with exam level questions to help them get used to the recent pattern. Attempt this quiz and check your preparation. Q1. 12 men can complete a work in 90 days. 30 days after they started work, 2 men left and 8 men joined. How many days will it take to complete the remaining work? Q2. A can do a piece of work in 20 days and B in 15 days. With help of C, they finish the work in 5 days. In how many days C alone can do the same work? एक एक काम को 20 दिनों में और B 15 दिनों में कर सकते हैं. C की मदद के साथ वे काम 5 दिनों में करते हैं. समान काम को C अकेले कितने दिनों में कर सकता है? A, 1/3 काम को 5 दिनों में और B, इस काम के 2/5 को 10 दिनों में कर सकता है. A और B दोनों एक साथ काम को कितने दिन ख़त्म कर सकते हैं? A और B एक काम के लिए 250 रु लेते हैं. A अकेले उस काम को 5 दिनों में कर सकता है और B अकेल उस काम को 15 दिनों में कर सकता है. C की मदद के साथ वे काम को 3 दिनों में ख़त्म कर देते हैं. यदि प्रत्येक को उनके द्वारा किये गए काम के समानुपात में भुगतान होता है तो C को मिलने वाली राशि होगी? Q5. The daily wages of A and B respectively are Rs. 3.50 and Rs. 2.50. When A finishes a certain work, he gets a total wage of Rs. 63. When B does the same work, he gets a total wage Rs. 75. If both of them do it together what is the cost of the work? Q7. Ramesh and Rahman can do a work in 20 and 25 days respectively. After doing collectively 10 days of work, they leave the work due to illness and Suresh completes the rest of the work in 3 days. How many days Suresh alone can take to complete the whole work? Q8. A and B together can do a piece of work in 12 days which B and C together can do in 16 days. After A has been working at it for 5 days, and B for 7 days, C takes up and finishes it alone in 13 days. In how many days could each do the work by himself? A और B एकसाथ एक कार्य को 12 दिन में पूरा कर सकते हैं जिसे B और C एकसाथ 16 दिन में पूरा कर सकते हैं. इसपर A के 5 दिन कार्य करने के बाद B के 7 दिन कार्य करने के बाद, C इसे 13 दिन में पूरा करता है. प्रत्येक व्यक्ति कितने दिन में कार्य कर सकता है? Q9. A contract is to be completed in 46 days and 117 men were set to work, each working 8 hours a day. After 33 days, 4/7 of the work is completed. How many additional men may be employed so that the work may be completed in time, each man now working 9 hours a day? एक अनुबंध 46 दिनों में पूरा किया जाना है और 117 पुरुष काम पर लगाये जाते है, प्रत्येक प्रति दिन 8 घन्टे कार्य करता है. 33 दिन बाद, 4/7 कार्य पूरा होता है. कितने अतिरिक्त पुरुषों को नियोजित किया जा सकता है ताकि काम समय पर पूरा हो सके, प्रत्येक व्यक्ति प्रति दिन 9 घंटे कार्य करता है? Q10. A is twice as fast as B, and is therefore able to finish the work in 30 days less than B. Find the time in which they can do it working together.